I often imagine my grandparents leaving all that they knew – their former life completely behind – with the hopes of a better world in America, the land of unlimited opportunity. Perhaps they were fleeing war or poverty. A small satchel carried all their worldly possessions – a change of clothes, a treasured picture. They spoke no English. They survived a wave-tossed Atlantic crossing in the overcrowded 3rd class conditions of a steamship with sea-sick passengers. Arriving in New York Harbor looking out from the ship with the first view of the Statue of Liberty and the tall buildings of Manhattan. So different from the small villages they had left behind. Ellis Island was known to the Italians as isola di lacrime (Island of Tears) or isola di speranza (Island of Hope) depending on their families experience. Surely in my grandparents minds was the fear that upon entering America they would not be deemed worthy of staying and sent back on the next steamship. 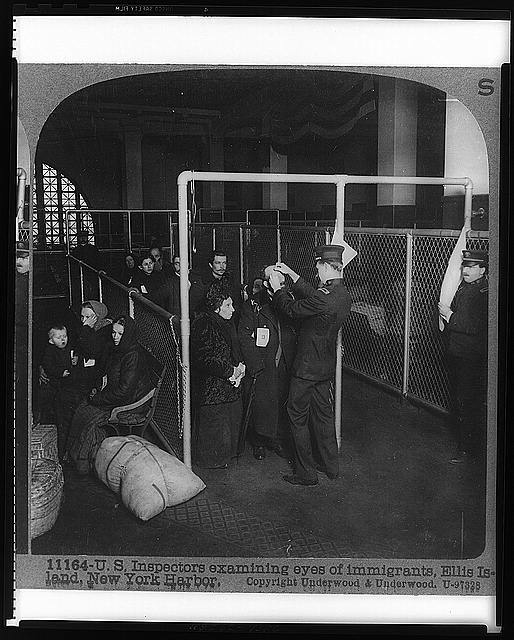 Newly arriving 1st & 2nd class passengers were left off in lower Manhattan with a quick scan of their papers. Immigrants in third class steerage however were ferried by barge, with their few possessions to Ellis Island. As they disembarked at Ellis Island, officials known as “groupers” shouted to them to form two lines: women and children in one, and men in the other. Each person was tagged with a color-coded slip of paper (indicating the steamship line) inscribed with a manifest number, the name of the steamship, and the immigrant’s name. The first step was medical inspection. In particular, doctors looked for rashes, fever, birth defects, limps, labored breathing, excessive coughing, lice, contagious eye disease and even feeble mindedness. Anyone with suspected health issues was marked with chalk on their clothing and sent to the Ellis Island hospital, where their ultimate fate would be determined. Upon passing the physical examination or release from the hospital, the next step was to be questioned by Immigration Inspectors. An immigrant’s fate literally depended on these men and the 29 questions they were required to complete during their voyage.